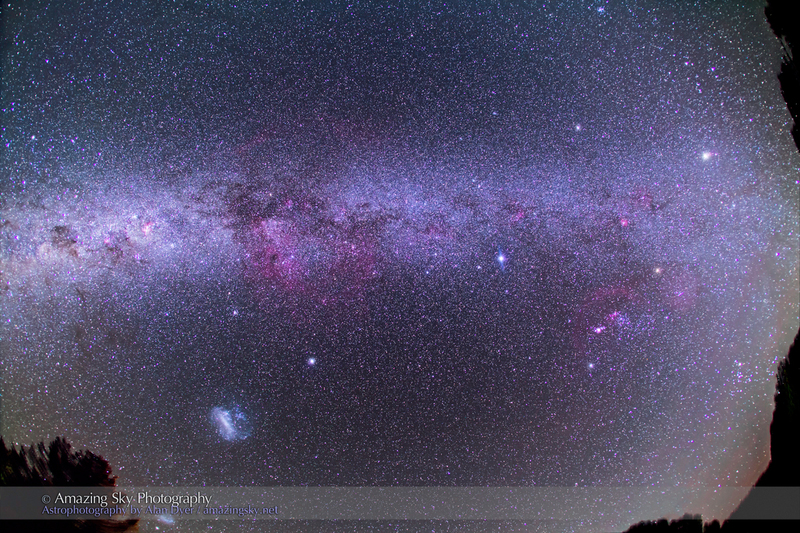 The Milky Way of the southern hemisphere arches across the sky from the Southern Cross to Orion. I’ve arrived at my dark sky site near Coonabarabran, Australia, with a very clear night to start my two-week session under the southern stars. Tonight I had just a 2-hour window between end of twilight and moonrise. But I made good use of it by taking some ultra-wide-angle views of the Milky Way we never see from up north. This horizon-to-horizon scene looks straight up and stretches from the Southern Cross at far left (in the east) through Vela and Puppis to Orion at right (in the west). 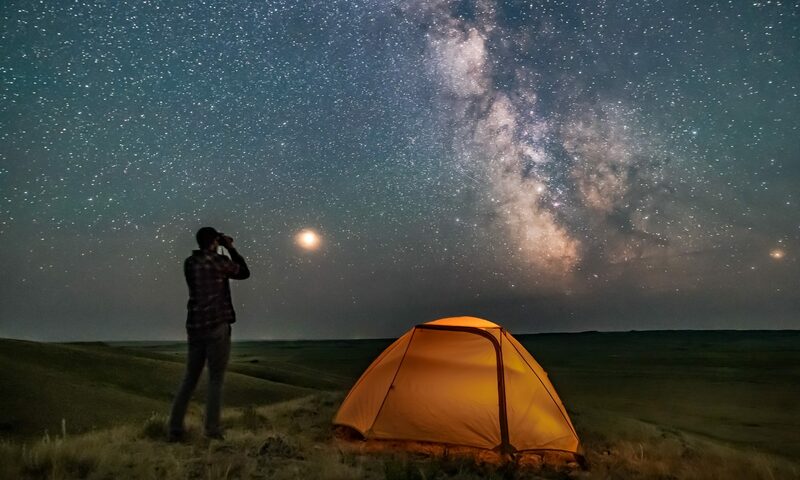 This sweep includes much of the Milky Way forever below our horizon from northern latitudes. At centre is the wide loop of the Gum Nebula. At lower left is the Large Magellanic Cloud, a satellite galaxy of the Milky Way. At upper right is Jupiter in Gemini. The two bright stars near the centre are Canopus (left of centre) and Sirius (right of centre). This is a stack of five 5-minute exposures at f/4 with the 15mm full-frame fish-eye lens on the Canon 5D MkII at ISO 1000. The camera was on the iOptron Skytracker, its first time in the southern hemisphere and my first time aligning it on the South Celestial Pole. It took a few minutes but I got it! The tracker worked great. The forecast is for clouds and rain the next few days. But I’m here for over two weeks, and the weather can’t be any worse than it was in 2010 when the area was flooding. So with luck there will be more images to come from down under. Wow!, like it – thanks! Wonderful shot, Alan. Clearly the Coona skies are just still as beautiful as I remember them. Nice to see.